LONDON (AP) — Seven British lawmakers quit the main opposition Labour Party on Monday over its approach to Brexit and anti-Semitism — the biggest shake-up in years for one of Britain’s major political parties. The announcement ripped open a long-simmering rift between socialists and centrists in the party, which sees itself as the representative of Britain’s working class. It’s also the latest fallout from Britain’s decision to leave the European Union, which has split both of the country’s two main parties — Conservatives and Labour — into pro-Brexit and pro-EU camps. Many Labour lawmakers have been unhappy with the party’s direction under leader Jeremy Corbyn, a veteran socialist who took charge in 2015 with strong grass-roots backing. They accuse Corbyn of mounting a weak opposition to Conservative Prime Minister Theresa May’s plans for leaving the EU, and of failing to stamp out a vein of anti-Semitism in the party. Those leaving Labour have between nine and 27 years’ experience in Parliament and represent constituencies across England but still make up only a small fraction of Labour’s 256 lawmakers, or of the 650 total members of Parliament. But this is the biggest split in the Labour Party since four senior members quit in 1981 to form the Social Democratic Party. “I am leaving behind a culture of bullying, bigotry and intimidation,” the 37-year-old politician said at a news conference alongside six colleagues. Labour leaders have admitted that Berger, who is Jewish and pregnant, has been bullied by some members of her local party in northwest England. Labour has been riven by allegations that the party has become hostile to Jews under Corbyn, a longtime supporter of the Palestinians. Corbyn’s supporters accuse political opponents and right-wing media of misrepresenting his views. There have long been signs that British voters’ 2016 decision to leave the EU could spark a major overhaul of British politics. May’s own Conservatives are in the throes of a civil war between the party’s pro-Brexit and pro-EU wings. Labour is also split. Many Labour members oppose Brexit — which is scheduled to take place in less than six weeks, on March 29 — and want the party to fight to hold a new national referendum that could keep Britain in the 28-nation bloc. But Corbyn, who spent decades criticizing the EU before becoming a lukewarm convert to the “remain” cause in the 2016 referendum, is reluctant to do anything that could be seen as defying voters’ decision to leave. “I am furious that the leadership is complicit in facilitating Brexit, which will cause great economic, social and political damage to our country,” said Mike Gapes, one of the departing lawmakers. 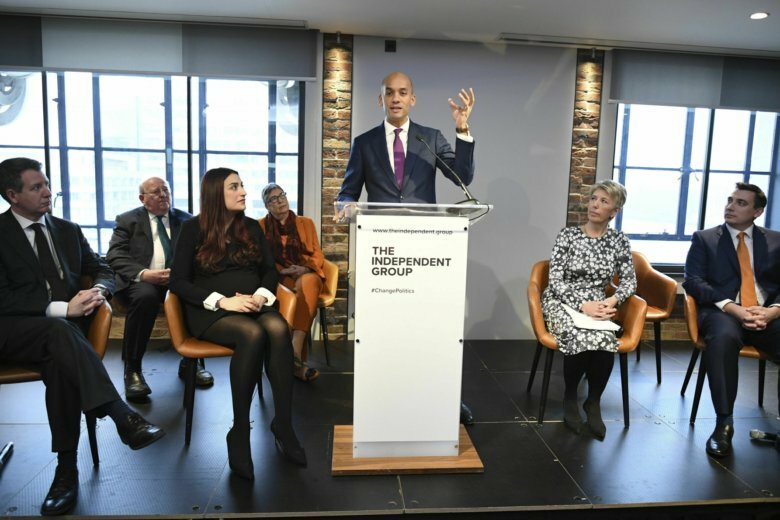 The seven members of Parliament said they will continue to sit in the House of Commons as the newly formed Independent Group. The Labour lawmakers who quit in 1981 eventually became today’s Liberal Democrats, a centrist party that has failed to topple the dominance of the two bigger parties. The new group of seven stopped short of forming a new political party, but the seeds have been sown. The new group has a name, a website and a statement of principles, which argues for a mix of pro-businesses and social-welfare measures and a pro-Western foreign policy that is closer to the “New Labour” of former Prime Minister Tony Blair than to Corbyn’s old-school socialism. The departing lawmakers said they would not be joining the Liberal Democrats, and urged members of other parties to help them create a new centrist force in British politics. Victoria Honeyman, a lecturer in politics at the University of Leeds, said history suggests the breakaway group will struggle to gain traction in British politics.